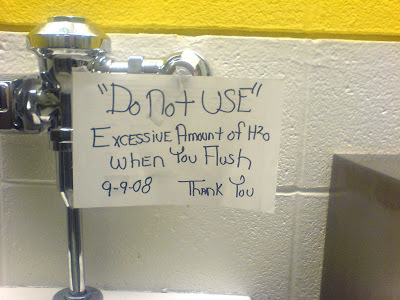 Dan saw this on a urinal in the engineering building of a state university campus. Clearly, you can use the urinal in a real emergency. The real question is, what first day of school engineering prank made this happen? Not sure what "H-squared O" is. I love the fact that they felt the need to put a date on it. Is it OK to use it any other day? It's just a faulty Sloan valve. If you flush the toilet next to it and then whack the valve with a wrench or something else solid, it will shut off no problem.